Bishopthorpe Sports and Social Club will be holding their fourth annual beer festival on the weekend of Friday 20th to Sunday 22nd March. Welcoming the connoisseurs at last year’s festival. There will be 2 ciders and 12 real ales on offer all at £3 a pint or try 1/3rd pint for just a pound. The festival starts at 6pm on the Friday with the York blues band “Up In Smoke” featuring Michael Johnson from Bishopthorpe playing later in the evening. Saturday kicks off at 12 noon until midnight with all the days sporting action on the TVs and big screen. Bishopthorpe Club has won the York CAMRA Club of the year award for 2015, and a specially brewed beer called Hatrick will be available to celebrate the third year in a row that the Club has won this award, which will be presented on Saturday afternoon by representatives from York CAMRA. 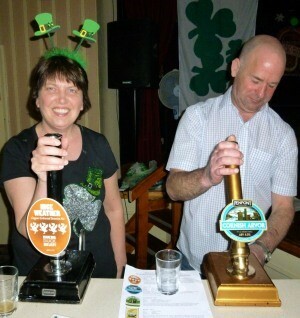 Come down and enjoy the craic and sample a few different beers at the same time. FREE ENTRY ALL WEEKEND – ALL WELCOME.